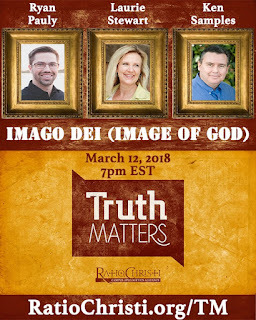 What a blessing to be invited to be on Ratio Christ's Truth Matters TV show to discuss Imago Dei, being made in the image of God. Thank you Tony Gurule! Ryan Pauly on "Human Value and the Image of God." Laurie Stewart on "In the Image of God." Ken Samples on "Imago Dei: A Divine Reflection."